Winona Ryder was the quirky Oscar-nominated "it girl" of the 90s. She was in a slew of iconic movies like Heathers, Edward Scissorhands, Little Women and Girl, Interrupted. Ryder was able to hold her own against powerhouse costars like Johnny Depp, Christian Bale and Angelina Jolie and did it all with style. Then a certain unnamed event happened that caused her to be the laughing stock of Hollywood and she kind of faded into the background (she was still making movies but not with the same clout). But I'm ready for her to make a big comeback! Aren't you? Ryder has a few movies slated for 2009 including the highly anticipated Star Trek where she'll be playing Spock's mother. But I'm more excited about her roles in Stay Cool and The Private Lives of Pippa Lee. She plays the romantic lead in Stay Cool and in Pippa she'll be part of an all-star cast (Robin Wright Penn, Alan Arkin and Julianne Moore) that could gain some serious momentum come awards season. Wow, Ryder is a great actress. I think she will do well in the upcoming Star Trek movie. I miss Winona! She and Juliette were two of my favorite actresses of the nineties. That's a great photo of her! OMG! Winona's old enough to play a mother? When did that happen? Wow, I really miss Winona too. I forgot how much I missed her -- I wonder who this generation's 'Winona' is? It's a tough question. Winona had Edward friggin' Scissorhands! That's a hard one to top. Even some of her smaller flicks like Reality Bites and Boys were really good. Plus she was in Lucas with the Corey Haim and Charlie Sheen. 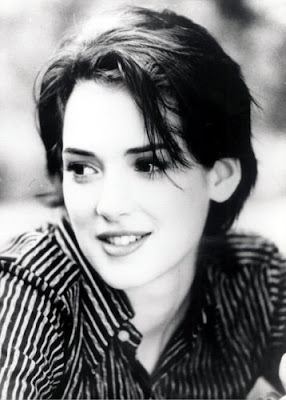 Move over Kevin Bacon, maybe it should be the 7 degrees of Winona Ryder. OMG I looooved Lucas! That was the period where I loved Corey Haim. Now, he's fallen down the path of many other child actors. Great Winona picks! My favs are Kat Dennings and Zooey Deschanel.